On Sale Now! 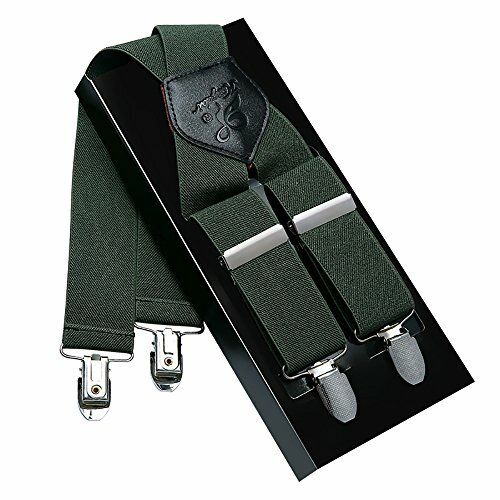 Save 6% on the Men Suspenders KANGDAI Suspenders For Men Green 4 Clips Wide 1.4'' X Back Heavy Duty Men Braces Elastic Durable Suspenders Strong Metal Clips (Green) by YOUNGJIAN at SCRHI. MPN: 43230-141055. Hurry! Limited time offer. Offer valid only while supplies last. A little effort every day, a big change one day. ◇ KANGDAI has been committed to exporting suspenders to many countries for more than 30 years. A little effort every day, a big change one day. range of customers and grown hugely popular for its excellent quality and fashionable design. reliable products to customers. We sincerely hope that every customer can enjoy the best shopping experience in our store. Material: High quality straps, leather, steel clips, steel buckles, etc. ❤ Thicker clamp - The middle steel buckles, etc, of the old process viscose, definitely not easy to fall off. ❤ Accessories leather stitching - It will not break; to ensure top durability. ❤ Style and color - Suitable for all types of people. ❤ Gift box packaging - Giving it a more Decent appearance. In order to extend the product's service to you, please don't wash item with hot water or make use of a washing machine to wash it. ☆ It is made up of 65% polyester, 23% metal and 12% Leather. The suspenders can stay firmly attached to any pant. No more falling pants! ☆ The strap length is 43 inches and its width is 1.38 inches. Its adjustable straps could make one size fit many. With various festivals coming, it can be an ideal present for your friends or families. ☆ In order to meet more customers' needs, we provide various fashionable and attractive suspender types, suitable for different occasions; dinners, weddings, Christmas, Easter, etc. ☆ The suspenders do not hurt the clothes while it does its job of preventing your pants from slipping. Besides, the color does not easily fade and it stays span-new for a long time. So, it can be a trustful companion for your outings. ☆ QUALITY GUARANTEE: If you are not satisfied with our products, please contact us and we will be sure to offer you a full refund or a new replacement without any hesitation. If you have any questions about this product by YOUNGJIAN, contact us by completing and submitting the form below. If you are looking for a specif part number, please include it with your message.